Property Tax constitutes the single biggest source of revenue for the New York City Government, accounting for approximately $22.5 Billion dollars in the Modified FY2016 Budget. That’s a lot of money, and I’ve always been curious about how properties are assessed, how exemptions and abatements are applied, and what the overall property tax contribution is of a neighborhood, a block, or any other chunk of the city. As it turns out, everything about property taxes is public record, but there isn’t really any quality bulk data around about it in NYC. Some aspects of property taxes show their face in PLUTO, including assessed value and abatement, but I learned a few years ago that that’s only part of the story, and you can’t infer from PLUTO how much a property actually pays in taxes. For that information, you have to look at the bills, which are also public record. The NYC Department of Finance has an online tax bill lookup tool, where you can search for any property by BBL (Borough, Block, and Lot Numbers) or Address. Every statement and bill is available, going back for several years. If you scroll down to the 2nd page, you’ll see a nicely formatted section called Annual Property Tax Detail, and here is where you’ll find all of the goodies, including “the bottom line”, or how much that property owes the city for a given tax cycle. 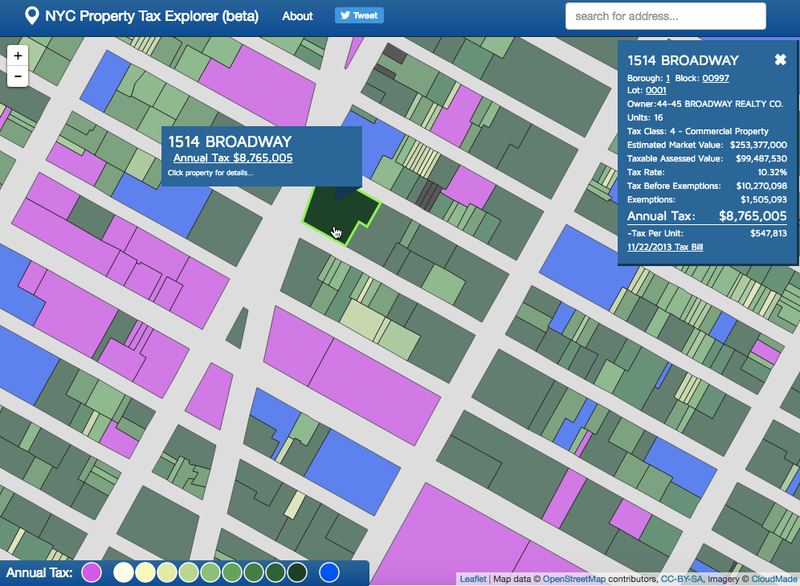 Back in 2013, I put together a little project to extract these nuggets of data, as I wanted to make a simple web map that would allow you to explore property taxes. To accomplish this, we wrote a series of scripts to download thousands of tax bills and scrape the text out of them. The text was then parsed, resulting in machine-readable data for each property we had a bill for. We ended up pulling out most of the data for Manhattan (condos excluded), and the rudimentary map is still up today at nyctaxmap.herokuapp.com (this hasn’t been updated since, and won’t be) It was always my intention to expand it to the rest of the city, and to share the bulk data, but like so many civic hacking projects, it never happened. Last year, NYC Civic Hacker John Krauss located another gold mine of data in the tax bills, specifically the number of rent stabilized units in an apartment building. Activists and renter’s rights groups had been in search of authoritative data on rent stabilized units, and John figured out that he could get high quality data at the building level by scraping every bill for apartment buildings with over 6 units. He found that surcharges for rent stabilization revealed a massive concentration of stabilized apartment loss in certain neighborhoods. 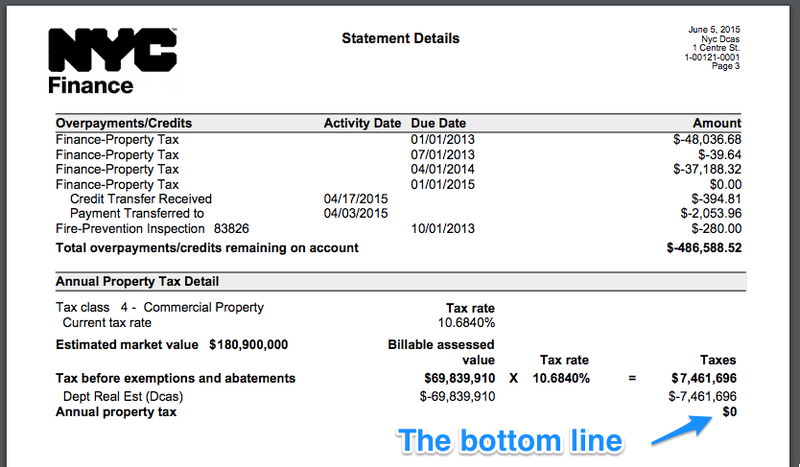 Read his blog post about the rent stabilization data here, and check out the raw tax bills and data at taxbills.nyc. There’s also a great article at ProPublica about the rent stabilization failure-to-report-but-still-getting-the-tax-break situation. Ben Wellington (iQuantNY) has also done an analysis of the rent stabilization data that was liberated from the tax bills, showing the net change over time among other things. Read it here. We teamed up to expand taxbills.nyc to include every BBL in the city, condominiums included, with a goal of assembling high-quality granular data including every exemption and abatement in the city. We used MapPLUTO 15v1 as our master list of BBLs, and the DOF assessment rolls to get an exhaustive list of condo BBLs and to join the condo units to their physical tax lot. The data exist in two tables, one with a row for each BBL in the city, containing estimated market value, tax rate, total tax due, etc, and the other containing a row for each individual exemption and abatement found in the bills. There is a one-to-many relationship between these tables, as many exemptions and abatements can be associated with a single BBL. These two tables were derived from the very large rawdata.csv on taxbills.nyc. You can see the exact SQL queries and some other aspects of our methodology on the notes page. According to the data, the total tax before exemptions and abatements is $34.5 Billion. This is, in theory, the amount the city could collect if there were no exemptions and abatements. I’d love to see what this number would be if real market values were taken into account citywide. Let’s take a high-level look at the exemptions and abatements. You can see the full list of all 147 exemptions along with a sum ($) and count column in the table below. I’ll keep my opinions to myself for now and just show you the data. Something wonky is going on with that last line “veterans exemption total”. If anyone figures it out, please let me know. By joining the data with MapPLUTO in CartoDB, we can visualize the tax footprint of the entire city. (Once joined, you can also use the rich lot-level data in PLUTO to analyze property taxes based on zoning, land use, etc) I have colored lots with zero tax due as pink, but bear in mind that it’s often not so simple and things like Payments in Lieu of Taxes (PILOTs) are not reflected in the tax bills. Condo units are outlined in yellow. So there you have it… we turned 1.1 million pdfs into a high quality open dataset on NYC property taxes, including all exemptions and abatements. Data scientists everywhere, go forth and crunch the numbers, and please share your findings on twitter with me (@chris_whong), John Krauss (@recessionporn) and Ben Wellington (@iquantny). We can’t wait to see what you come up with! 6 Responses to "Liberating Data from NYC Property Tax Bills"
Great work! Very curious about the technical details and difficulties of parsing the PDFs. I know from personal experience that isn’t always a trivial task, so and i get discouraged when I see datasets enclosed in thousands or more of PDFs. Were you just lucky with these PDFs, or did you have to do some special tricks to parse them? The first step is extracting the raw text from the PDFs, which is only possible for certain types of PDFs. The linux command line tool pdftotext does this, and preserves the layout. Next, because every bill has a well-formatted area that shows the calculations and the final amount due, a custom script must be written to do pattern matching and isolate the individual fiehttp://chriswhong.com/wp-admin/edit-comments.php#comments-formlds (pattern matching using regular expressions).